Rarely a holiday goes by (whether we celebrate it or not here at Casa Lobo) that doesn’t cry out for a new hat that Benny the dog can wear. Enjoy this year’s Easter Benny..
Spring has sprung at the Central Park Zoo. The flowers are waking up after a long winter, and our animals are more active than ever. Come visit us. Our Breakfast with the Birds class (April 28th) is sold out but there are a few spaces left in our Family Program, Images in Spring (Sunday, April 14th from 9 to 10:30). This family program is designed for parents and kids to share a photo adventure before the zoo opens. Click here for details and to sign up. Great pictures again! You always seem to capture personality in every animal! I hope to visit New York again soon so I can visit Central Park Zoo this time! Lmao!! 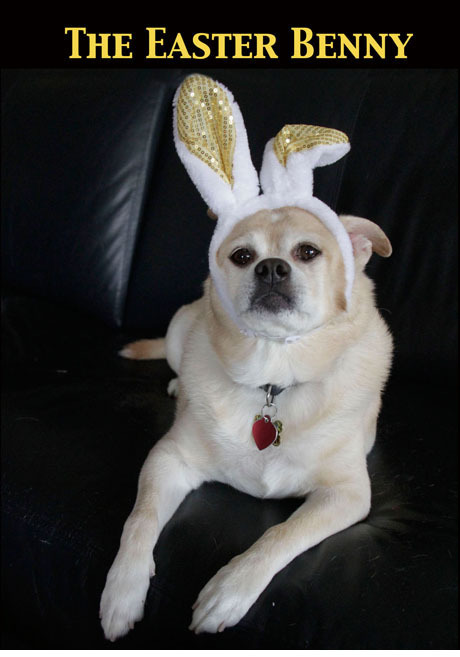 Easter Benny….just got back from Naples, Florida ….went to the Naples Zoo! It’s now a part of AZA and they are fundraising and building….love your pics as always!